Wow, 10 days without a post. Sorry about that, there has been a lot going on! 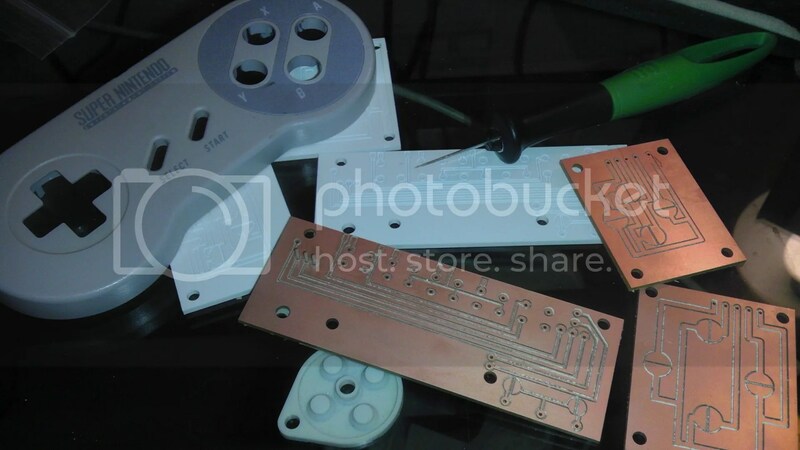 So everyone knows what’s up, I’ve been in the process of working on 3 different jobs all at once, though a majority of the time has been spent on the PCB and case design of the SNES-001 Advance II which I should be officially starting this week. Basically I’ve been putting a lot of time into playing with CAD and in doing so, also getting the component outlines and measurements into the computer for future use. Every drawing I do now has some form of base component, like D-pad and tact switch holes which I can use for future designs without actually spending all the time to design them from scratch. Currently I’m in the process of cutting out a test template for Jonathan Shine for his Envision clones. This will allow him to get the feel for the placement of the buttons and give him time to make some changes before we vacuum form and cut the casings for real. Nintendork is shipping the components for his portable N64 to me today and I’ll be cutting and assembling that for him in the next couple weeks or so. As mentioned before, I should be in contact with the potential buyer of the SNES-001 Advance II in the next few days and once that get’s rolling I’ll start up a work log topic over at MBB. This will be a far superior system to the original as the new equipment I have to work with allows that. I’ll keep you updated and hopefully more than I have been recently. Oh, you should check out the video to see a funny oops. Still learning and I’m glad this happened on a test piece! Printed Circuit Boards, Yeah I can make those!